Top players neutralize hard serves hit directly to them with the two foot pivot. In the last two articles, we looked at the Contact Moves for aggressive returns (Click Here) and defensive returns (Click Here). Now let's turn to what happens when you hit what I call a Rally Return. On a Rally Return, the returner's goal is to maintain his court position and get into the point on an even footing. My research shows there are two basic Contact Moves players use to hit Rally Returns. The first is what I call the Two Foot Pivot. The second Contact Move for a rally return is the Low Spin. 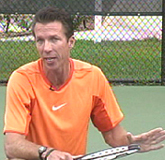 Both moves can be hit on either the forehand or backhand side. This month we'll start with the Two Foot Pivot returns, and next month we'll look at the Low Spin. So, as we have for the other return contact moves, let's go over the components involved in hitting a great Two Foot Pivot on both sides. The split step, followed by a small outstep and a quick body turn. Players use the Two Foot Pivot on a serve that comes directly to them, usually hit with pace. There is little or no movement to the ball. 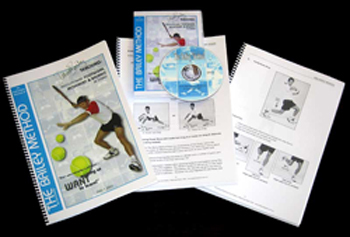 The player uses a rapid turn move and then the forward rotation of the body, particularly the hips, to match pace with the opponent and neutralize the serve. The player begins the return with a split step, followed by the out step. The out step for the two foot pivot allows the player to quickly rotate his torso and shift his weight to the outside. Typically this will be a pivot step or a small step out. Because the player is standing his ground, the amount of movement is usually minimal. At times, however, they player may also adjust his position slightly to the ball. This can be accomplished with one or at most two steps or with more smaller, adjusting steps. Since the body is rotating more or less in place, the two foot pivot is normally hit quite open. This means either a fully open, or a mild semi open stance. Note that at the completion of the turn, the tips of the toes have turned at about a 45 degree angle to the baseline. The forward swing�note the rotation of the hips and the feet. In my research I have found that an open stance two foot pivot is more effective when the player is hitting the ball either down the line or down the middle of the court. A semi open stance is more effective when the player is hitting an angled return. Once the stance is established, the player then pivots the hips to drive the shot. The feet rotate in place with the toes finish pointing towards the target. The player should stay low without jumping and keep the body alignment straight up and down. The player also keeps the angles in the legs basically unchanged in the forward swing. Remember the Two Foot Pivot is a rally move. You are letting the ball come to you and using your opponent's power. The secret is to stay low, relaxed and stable. You are relying on the rotation of the lower body to help make the return. The balance move on the Two Foot Pivot is what I call an inside knee drop. The knee furthest away from the ball drops straight down towards the court as both feet pivot. The inside knee drop helps you extend through the swing and prevents you from coming up too early and losing balance and power. Agassi demonstrates the knee drop balance move and a strong crossover recovery step. The recovery steps will be side skips for a shorter recovery position or a front crossover step as the first recovery step if a longer recovery distance is required. A front crossover step is faster and covers more distance than a side skip. On the backhand the two foot pivot is used in the same way as on the forehand. Typically this is on a hard struck serve hit directly at the player on the backhand side. The Ana Ivanovic animation demonstrates the elements perfectly. After the split step into a wide, athletic base, Ana uses a pivot step with her outside foot to turn her hips and shoulders. Notice the fully open stance. The toes of the feet are pointed at roughly a 45 degree angle to the baseline. Now Ana rotates into the shot, driving the hips through to generate the swing. Note how she stays low with both feet on the ground, and how the angle of bend in her legs stays constant. A perfect two foot pivot backhand return: quick turn, torso rotation into the shot, knee drop and crossover recovery. As with the forehand, the two foot pivot on the backhand allows the player to stand her ground and neutralize the serve. This contact move allows players to get into the point on an even footing even n aggressive body serves. Ana's balance move is, again, the same as on the forehand, a knee drop. Watch her leg closest to the center of the court bend at the knee, reaching an angle approaching 90 degrees. After the balance move she begins her recovery. Like Agassi on the forehand pivot above, she uses a front foot cross over. This is the fastest and most efficient pattern, which can then be followed by side steps. The two foot pivot is an awesome weapon for any player. It can help you eliminate missed returns, and surprise opponents with solid replies to aggressive serves. It's a critical component of any return game. Next, stay tuned for the second rally return: the low spin!